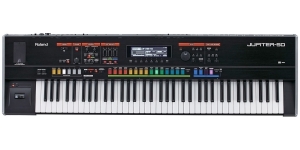 Roland didn’t try to make Jupiter 8 out of Jupiter-80, but we can’t deny that the instrument failed to keep the famous name at the proper level. The 100% digital sound engine of the new Jupiter is based on Supernatural technology, sampling every note of a live instrument. 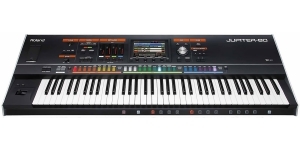 Behavior Modelling Technology reproduces the nuances of each note, analyzing the performance, and introduces some peculiar features to bring more expression. 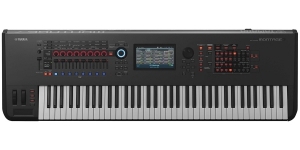 Thus, a 76-note semi-weighted keyboard with aftertouch makes string and wind believable enough. Legato performance will be reflected in natural slides, while sharp pressing can be easily taken for biting pluck of a real string. 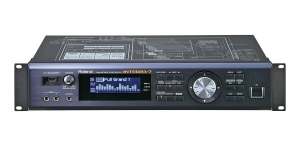 For a performance synthesizer, its control panel with a somewhat arbitrary control set is too minimalistic and among the details includes: multi-regulation of the "tone blender" function, filter cutoff frequency knob, pitch/modulation wheel, volume switching. The management of the effects is optional (reverb/rotor on/off), there’s no envelope and filter control. But the screen somewhat makes up for the lack of opportunities; thanks to it you can change the value of the parameters or assign them. 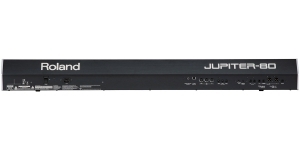 In addition, Jupiter-80 has a brand controller for assignable D-beam functions, which transforms the sound the way you configure the signal processing control logic. 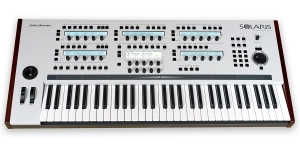 JP-80 is based not on a standard patch-performance concept, but on a "tone", which can belong to both Supernatural Acoustic and Supernatural Synth. At the Live Set level, there can be up to 4 layers of such acoustic and synth sounds (at this stage, envelopes, filters and effects are adjusted). Two Live Sets can include the next level - Registration. 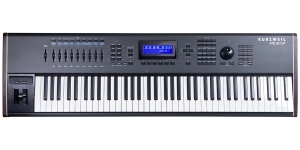 Registration is the carrier or the capture of all kinds of settings and supervises 4 parts: Upper, Lower, Solo, and Percussion, each of which is controlled individually with sliders and switches featured on the front panel, Live Sets are assigned to them. Thus Registration can number up to 10 tones. The construction of 10 tones provides an impressive stream, given the 256-note polyphony. Synth section "Supernatural Synth" is represented by 3 oscillators with two LFOs, ring modulation and a multimode filter. 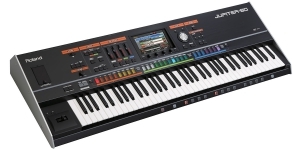 However, Jupiter 80 allows you to achieve almost a multi-oscillator effect, if you take into account the power of two Live Sets 4 tones each and add tones from the Percussion and Solo parts. 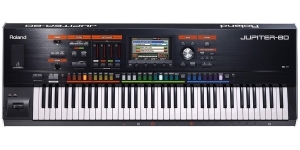 Despite the lack of control editing on the front panel, it is quite convenient for live performance, which, however, is expected from the performance synthesizer: it is easy to manage the Registrations, banks and sets, you can find the "lock" option, preventing accidental pressing of the unwanted setting, Switches will give quick access to categories of sounds with the ability to assign favorites. Supernatural Acoustic tones truly deserve to be taken for real instruments with proper layering and playback. 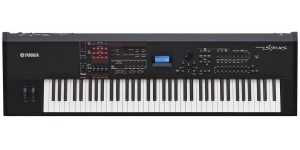 Acoustic and electric pianos sound warm and deep, especially influenced by phaser, delay, wah-effect and emulated speakers. The guitars of the new Jupiter 80 sound in a completely new way, featuring an interlacing of technologies. The architecture of the Jupiter-80 is slightly eccentric, but the tone around which the creators built the idea is a kind of rational grain that makes the new approach quite understandable: a living, realistic, expressive sound is an acknowledged achievement of this instrument. 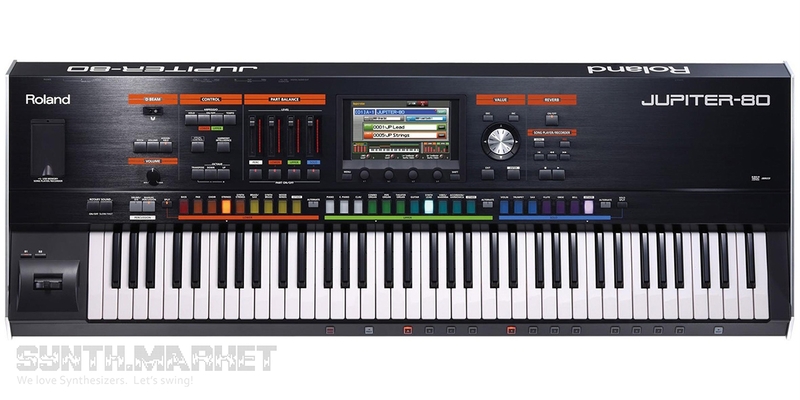 Synthesizer, Performance Synthesizer, Digital (D), Voices: 128, Multi Timbral Capacity: 16 part(s), Aftertouch, Velocity Sensitivity, Size: 6.5, Number of Keys: 76.